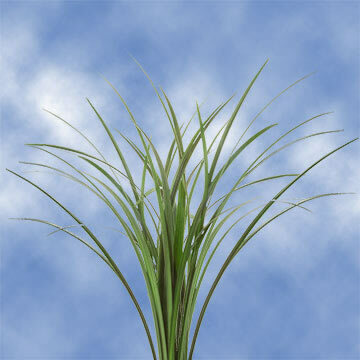 Lily Grass / Bear Grass is a light and wispy floral filler that adds dimension to just about every arrangement there is. It can range in height from 22" to 24". Delicate to the eye, yet strong in its usage, It adds detail because of its striking versatility. Often used in Bridal arrangements for both brides and bridesmaids. Because the lovely green shade is so often found in nature, its use is an easy accompaniment to any bud. It can be bent or wound around blossoms to provide a whimsical effect, and can actually allow the bouquet to appear slightly larger in size. For an extra-special touch to a bride or bridesmaids bouquet, winding strings of pearls through and around it provides a feminine effect that is simply unique and truly speaks to the Bride's taste. It is also popular in tabletop arrangements, both short and tall, for dinner and cocktail parties. Petite tabletop arrangements typically use shorter stems, and it adds a boldness that offsets its size. In an elevated tabletop arrangement, they will accentuate the vase, as the tips gracefully bend toward it. Birthday bouquets will take a more contemporary feel when Lily Grass / Bear Grass is wrapped around the flower stems. The use of thema= in this manner will help support each stem in the bouquet and looks lovely in a glass vase. Globalrose is absolutely committed to providing customers with the freshest florets. Our environmentally-friendly greenhouses and the latest technology guarantee high quality products. When you place an order with Globalrose, you can be sure your order will be carefully hand-selected just for you. And because we know your special event is so important to you, we will have your order delivered to you just 4 days after your orders are cut. Color tones for all products may vary due to the computer monitor and/or Mother Nature.